Jonas Valanciunas and Serge Ibaka picked up where they left off against the Clippers, which ignited the Raptors to start off strong. JV had 10 points and Ibaka added 8 points on top of that. Toronto was able to take the early lead against the Phoenix Suns thanks to their 7 assists. 5 of DeMar DeRozan's 9 points came from the free throw line, which he is one of the best in the league at getting to. The only problem Toronto had in the 1st quarter was containing Alex Len, who put up 7 points. The Raps led 37-31 to end the 1st. Toronto's shooting struggles from behind the arc continued into this game, and especially in the 2nd quarter. The Raptors missed all four of the attempts they shot from three. They forced 4 turnovers, which made up for their poor shooting. An area of concern was Toronto's transition defense. Following a Dragan Bender block, Phoenix Guard Troy Daniels made a wide open three while there were some Toronto players still running back. Luckily, Ibaka and Valanciunas combined for 9 points which helped Toronto finish out the 1st half with the lead. The Raptors went into halftime leading 37-31. DeMar DeRozan exploded for 18 points in the 3rd quarter. OG Anunoby and Serge combined for 11 points in the quarter, which built Toronto a comfortable lead. With about the 40 seconds left in the 3rd, DeRozan made a contested jumper over his defender, which is the centerpiece of his craft. 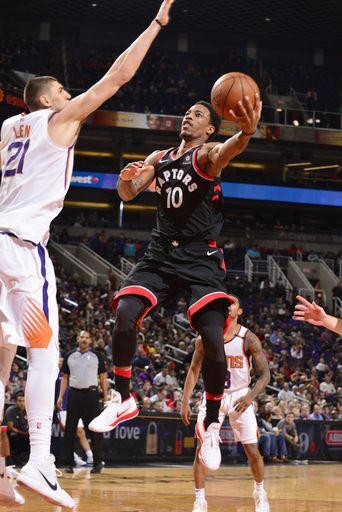 The Raptors played phenomenal defense going into the 4th quarter, not allowing the Suns to score for the last 2 minutes of the 3rd quarter. Heading into the last quarter of play, Toronto led the Suns 92-79. Phoenix's Troy Daniels was unstoppable, nailing 3 three pointers and scoring a total of 14 points. With about 1:45 left in the game, DeMar DeRozan made a floater after euro-stepping the defender. This play summarized DeRozan's night, as he was a real force to reckon with. In addition, DeRozan also hit the two free throws that Toronto needed in order the win the game. The final score was Toronto 115 to Phoenix 109.